Budget Wedding Venues in Delhi NCR You Should Book Right Away and Save a Buck or Two or Three! Fact - Delhi weddings are LARGER THAN LIFE. The movie Band Baaja Baaraat perfectly reflects the nuances of how a Delhi wedding looks like and is expected to be. Elaborate wedding venues, extravagant celebrations, glamorous couture, mouth-watering spread of food, overflowing daaru-shaaru, dhol and nagada, and much-much more. But with the family and the social and peer pressure of making your wedding one-of-a-kind and the one that “pura Delhi yaad rakhega”, couples and mummji daddyjis also look for ways where they can save some bucks. The major, most superlative decision of wedding planning is finding the venue. Only once the venue is booked can one progress with other wedding planning arrangements. Our research says that venue is usually a fourth of the wedding budget. If you are finding some budget wedding planners in Delhi, you are at the right place. So, we’ve dished up some dirt on the wedding venues in Delhi that are going to be lighter on your purse strings but brighter on the noise they will create as far as your wedding is concerned. These budget wedding venues in Delhi NCR are sure to fit your marked up wedding expenses. To cut costs further, you always have the option to book with Weddingz and avail up to 30% off. One of the most premium banquet hall in Chattarpur and on top of our budget wedding venues in Delhi, Mapple Exotica offers over 8 acres of area at your disposal. With multiple venue options available, one can find the perfect match within budget. A dedicated team of experts handle their banquets that ensure your wedding festivities run smoothly without any hassles. The Ocean Pearl Retreat understands what it means for the Dilliwalahs to host a big fat Indian wedding. To comfortably accommodate your needs to host an extravagant wedding on a budget, the hotel has five aesthetically designed, multipurpose banquet halls and two magnificent lawns you can choose from. Equipped with modern technology, lavish interiors and state-of-the-art lighting, each of its venues is sophistication at par. When a hotel that is optimally located, provides proximity to popular tourist attractions and offers tastefully decorated banquet facilities, what more can one ask for? When it’s all on a budget you can afford to host a grand wedding. With over 3 acres of beautifully manicured lawns and spacious banquets available, Golden Tulip is the dream venue to host your fanciful wedding. Should you need complete wedding planning services the hotel offers custom packages that can accommodate your specific requirements. A hotel that gives utmost attention to your wedding planning arrangements, Mapple Emerald located on NH-8 has an in-house event planning team who do a swell job. The team of this banquet hall in NH 8 caters to all that you need for your D-Day to run smoothly without any hiccups. Whether it is an intimate or a grandiose celebration, its tastefully designed property doesn’t fail to impress. Offering one of the best wedding banquet halls in Gurgaon to hold an intimate reception or pre-wedding functions, we have Leisure Inn that works to make your wedding day a moment you’ll cherish for a lifetime. Tastefully designed interiors speak volume about the venue and exceptional professionalism you can expect to receive. If the central idea of your wedding celebration is just family and close pals in attendance, this wedding venue not only serves the purpose with grandeur, but also fits well within your budget. 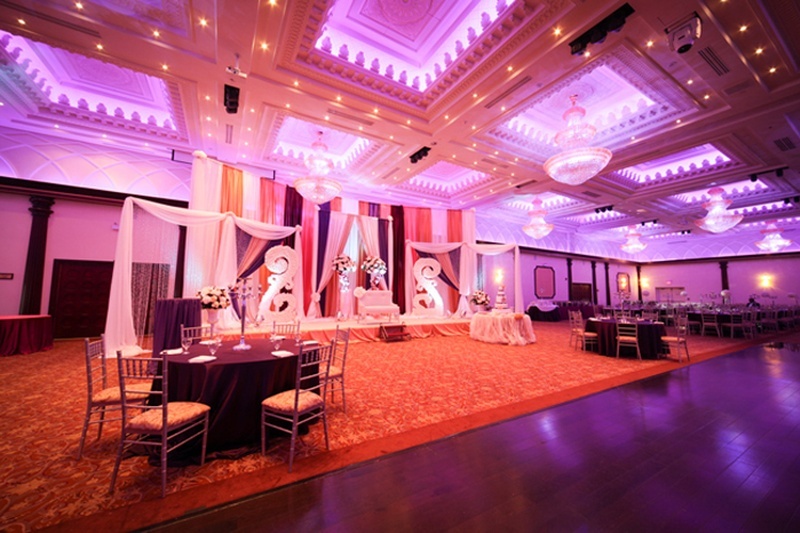 This is indeed of our preferred choices for budget wedding venues in Delhi. One of the most ideal and budget wedding banquet hall in Kaushambi, Grand Milan Sapphire should be on your priority list if you wish to organise an inexpensive. One of the best features of this venue is its subtly decorated banquet hall which will help you save a ton of money on your décor. Its team of in-house chefs creates lip-smacking dishes that will satiate the varied taste palates of your guests. Other highlights are mentioned below. Occasion Banquet also known as Crystal Banquets is a cosy air-conditioned party venue ideal to host small and intimate wedding receptions. The venue has three banquet halls, which can be combined, should you need the entire space for a closed and private celebration. Exquisite décor and mouth-watering food prepared by its in-house chefs offered at an affordable per plate cost are just few more plus points of this venue. Want to host a roof-top wedding on a budget? Country Inn & Suites by Carlson could help! This one is for the soon-to-weds who don’t believe in inviting the whole world to celebrate their union. Just family and best buddies, that’s all they need. Located in the heart of the commercial district, this hotel can make your wedding festivities sparkle with professional planning assistance who give utmost importance to the tiniest detail of your event. Lavanya Orchid is one of the pioneer banquets of West Delhi. You can choose from its three stylishly designed banquet halls each that reflect a distinct personality. Repeated bookings of the venue are a proof of its impeccable food, service, decoration and ambiance. Haven’t decided on your wedding theme yet or you don’t have a theme at all? This venue, is one of the best banquet hall in Mayapuri and will be your host and dost to get things up and running right from day 1 that you book the venue. From world-best theme décor to customisable food menu, its staff will be by your side like your bridesmaid or groomsmen ensuring the wedding experience you have and would want to give to your guests is spot on. One of the premium budget banquet hall in Peeragarhi, The Knots Banquet is known for its tasty food and lavish décor. Its two medium sized banquet halls are perfect to host all kinds of events, be it pre wedding, reception, birthdays or corporate events. Easy connectivity to the metro is another plus point of this venue that can make commute effortless for your guests. Hope our list of wedding venues in Delhi helps you in a way to organise a budget-friendly celebration.